MKS-TFT28 is an independent color touch product, suitable for the use of open source 3D printers. 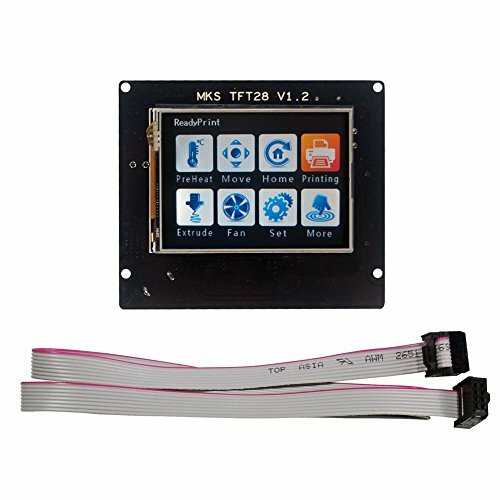 MKS-TFT28 is designed for MKS serial board, it can work with MKS BASE, MKS SBASE, MKS GEN, MKS MINI, etc. 1) 2.8 inch colorful touch screen, support U disk and SD card. 2) Support MKS Wifi module. 3) No need to adjust firmware, support Marlin, Smoothieware and Repetier. 4) Support power-black-out data saving. 3D printer can continue print previous job after power is back. 5) Support customize logo and button. MKS TFT can support picture customization, you can design the boot logo ,all button pictures, font color, etc. by yourself. 6) Support add custom function button. MKS TFT can support up to 7 custom buttons, the button instruction up to 200 characters. If you have any questions about this product by Gowoops, contact us by completing and submitting the form below. If you are looking for a specif part number, please include it with your message.